After several months of delays, the new Junction 66 gas station is set to open in just a matter of weeks, they told Sapulpa Times earlier this month. The location at the corner of Line and Mission streets has been under development for long enough to draw criticism from the community, but the owners assured us the wait will be well worth it. From the looks of things, they’re going to be right. The gas station, as it turns out, is much more than just a gas station. 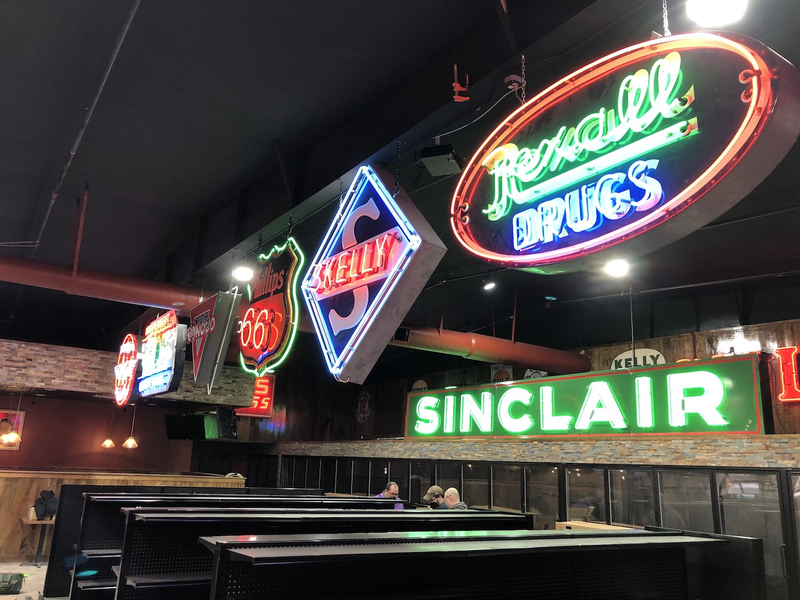 The signage and petroliana around the expansive space gives an allure of nostalgia as you see the very same signs that used to hang in downtown Sapulpa as far back as the 1940s. This Rexall Drugs Palace sign is the same one seen in old 1940s photos of downtown Sapulpa. It will now hang in the new Junction 66 gas station. Beyond the walk down memory lane are plenty of amenities to write home about, including a full-service restaurant with sectioned-off seating, and a large portion of the store devoted to grocery space—more so than virtually any other gas station we’ve ever seen. The grocery store is a nice addition, as that section of the Sapulpa has been called a “grocery desert,” if that’s something you can have in a town the size of Sapulpa. Nevertheless, the residents near the area have expressed excitement over the arrival of a competitive grocery store to their area—if only it would hurry up and get here. The owner, named Sunny, is well-known in Creek County for his adventures in convenience stores, having owned and operated several of them in the area. The most recent exploit is the new Smith Sisters Commissary off Highway 117 between Sapulpa and Glenpool—you’ll know it for it’s Krispy Krunchy Chicken. Sunny says the delays in getting the new store open mostly have to do with all the new features that the store will have…and it looks like they’ve spared no expense. The back wall of the store is lined with refrigerated shelves that Sunny says will contain ice cream, milk, eggs and other dairy products as well meat and possibly frozen vegetables or fruits. The corner refrigerator has been dubbed “the beer cave” and will have new high-point alcohol. On one side will be prominent produce tables similar to what you’d see at any grocery store. The tables at the restaurants have USB charging stations for your phone. The only thing that remains elusive is a grand opening date. When Sapulpa Times toured the facility on January 1st, we were told it’d be “three weeks or a month.” Now, we’re being told “a few more weeks” and trying to get anything more concrete than that is futile. The good news is, when the store does finally open, the experience is sure to be memorable, both for locals as well as travelers. I hope thy will offer some Route 66 merchandise or paraphernalia. With a name like that, they should make this a featured stop for those traveling the Mother Road. I completely agree, and hopefully reasonable prices.